This is an easy fix for when Windows 8 can’t find updates and just keeps searching but never installs or finds them. Or when Windows searches for updates endlessly. 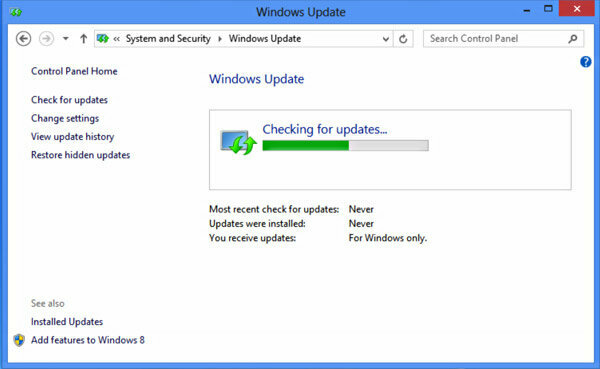 If you just installed Windows anew you may find your computer is searching for Windows updates endlessly but never finds any updates. Or perhaps the system was offline for a period of time and now you notice since being back online – your Windows just keeps searching for updates but never installs or finds them. This is a known issue with Windows 7 and 8. Especially in systems that haven’t been updated in awhile or for a new install of Windows 7 or Windows 8. Downloading and manually installing a Microsoft KB update fixes the problem instantly in 3 easy steps. STEP 1: Download the appropriate update direct from Microsoft’s update library. Scroll down the page and you will see the title “Microsoft Download Center”, the versions available for download and the “Download this package” link next to each one. Make sure you download the correct version x64 (32-bit) or x86 (64-bit). STEP 2: Once downloaded make sure you disconnect from the internet and then run the update you just downloaded. If you don’t disconnect from the internet when you run the KB update it will try to look for more updates and Windows will just keeping looking for updates endlessly. STEP 3: Once the install is done reboot your machine, connect back to the internet and then you will receive all the updates you are missing. That is all that needs to be done to do to fix when Windows 8 Can’t Find Updates. This issue has happened in Windows 7, Windows 8, Windows 10, Windows Server 2008 and Windows Server 2012r so it is a known issue with the fix of a simple KB update.